I have made some tests modifying the csv file, and even installed LibreOffice to ensure that the problem was not in Excel, but with no result. Final answer: Although the previous answers are valid as possible sources of problems when creating Plot location files ( the CSV files where the plot locations and IDs are stores) the real source of the problem for this user was an error on the documentation. At the end of the process for creating the plot file in the documentation it just says that one should import the file. This is true but not complete information. 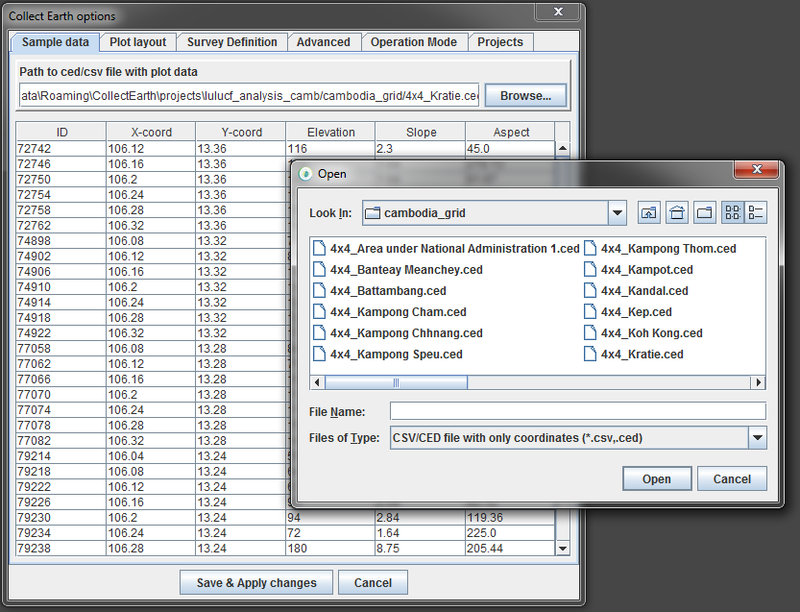 In order to import the file with the plot locations one has to go to Tools->Properties and in the first tab "Sample data" one needs to load the CSV file by clicking on the Browse button. This could be caused by a multitude of factors. The most likely problem is that the software you are using is not saving the CSV with the format that Collect Earth expects. The data in the CSVs read by collect earth mus be lines with the columns separated by commas ( the use of double-quotes is not necessary although it doesn't hurt ). If you are using Excel and you save the file using the CSV (MS-DOS) format it should be fine. Keep in mind that the first column ID is very important that the IDs for each plot are unique as Collect will use this information when it retrievex/stores the data for the plot. On another note, if you are not a great expert on QuantumGIS and want to add the region and DEM data (elevation,slope,aspect) you can do it through Google Earth Engine playground ( you must be a trusted tester though ). I have uploaded a test one here link. This script not only adds SRTM and Administrative area data but also Global Forest Change data for the plot, which might come handy if you want to validate the Global Forest Change product. Hi I am using the software suggested in the Collect Earth User Manual, that is QGIS and LibreOffice Calc. Nonetheless, the file exported at the end of the process has the figures saved as numbers, with no quotes. It is possible that this is the problem. I am trying to solve it but it is not easy, at least for me. How to run my own Google Earth Engine Playground script when clicking on a plot? Are there any tutorials in PPT format? What is the minimum number of training samples by land use-land cover class? Is there any ready landcover reference data to use?